By Peter Fernandez An Alef-Bet with a prehistoric twist! From Abbasaurus (daddy dinosaur) through Tayarasaurus (tourist), this dinosaur romp through the Hebrew alphabet, set in Israel, will delight young and old. With glossary and pictures to color. By Lieba Rudolph The letters in the prayerbook come to life and begin their journey to G-d. But will they have the strength to make such a long trip? This depends on the children who are saying them. Illustrated in Disney-like color to depict just how precious the prayers of children are to G-d. Sure to become a family favorite. By A. A. Milne Add Yiddish to the thirty-one languages into which A. A. Milne's classic Winnie-the-Pooh has been translated. Follow our Bear as he climbs the tree in search of honey (Krakh! "Oy gevalt!") and as he sings "Cottleston Pie" (translated here Varshever, varshever, varshever tort). And savor Ernest H. Shepard's memorable black-and-white illustrations. Longtime Pooh lover and noted Yiddish scholar Leonard Wolf has meticulously translated this British classic into the German-Jewish language that is alive and well and being reclaimed by young and old. Now fluent speakers and students alike can add the Best Bear in All the World to their Yiddish libraries. Thank You Hashem Offerings of thanks to G-d for light, bread, parents, and other wonderful things in life introduce the alphabet and words in the Hebrew language. TEACHER'S GUIDE ALSO AVAILABLE What do you use when you are bored with standard Hebrew workbooks and exercises? Aaron Frankel and his Hebrew school students designed the ideal Hebrew workbook for the intermediate grades. A Jerusalem Mystery is an interactive, full-color activity book for grades 7-9, in which students learn Hebrew while "touring" Jerusalem and solving a mystery. Students learn about Jerusalem's ancient and modern landmarks and holy places by translating and following clues. Along the way, word games and short exercises tutor students in simple written Hebrew and the basics of Hebrew grammar: pronouns and prepositions, verb roots, and the present tense. A Jerusalem Mystery is an easy-to-use, fun-filled workbook that will fascinate even the most inattentive students. It includes a special vocabulary card and a map of Jerusalem. By Chaya Kushnir Teaches children to write Hebrew script in a logical, fun, and illustrated way. Students learn to recognize the Hebrew letters--their shape and sound, how to tell them apart, and the correct order of the alef bet. The ideal introduction to Derech Binah: The Hebrew Primer. Visual Discrimination--Find the letter that doesn't belong. Connect the letters that are the same. Auditory Discrimination--Connect the letters that sound the same. Hebrew rhyming words. Print Writing--Each lesson includes a ruled machberet page for students to practice forming block print letters. Reading Games--Playful pages enliven the continuous drill work required for a firm reading foundation. Prayer Practice--Blessings, prayers, Hebrew songs, and the Four Questions. All presented in large, clear type. Speed Reading--A playfully competitive approach to encourage reading fluency. 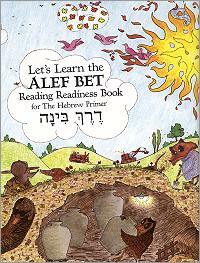 Words to Read and Understand--Students practice reading the alef bet with real Hebrew words, both modern and prayer. Derech Binah introduces look-alike letters together, along with reading exercises to help discriminate between them. Depend on the primer that has already brought a generation of students to Hebrew literacy. by Florence Cassen Mayers A bilingual ABC book with illustrations of artifacts from the Israel Museum in Jerusalem. The book contains outstanding art and layout; a particularly unusual feature is that - because a Hebrew book opens from left to right - the alphabet in this book has been arranged back to front. By Amye Rosenberg Learning the Hebrew alphabet becomes a page-turning adventure as Sam the Detective takes students through an alef bet sleuthing escapade. Mem sounds like M. This mad mouse magician makes magic and mischief into his mini-monster machine. Color the mem monsters he made. With Sam as their guide, students will color in pictures to reveal the Hebrew letters hidden within, trace & print the letters, learn the vowels, recognize the letters and vowels in simple syllables and words, and the best part is that children will laugh and play the whole way through. Alef Bet Fun A guide, with exercises and games, for learning the names and sequence of the letters of the Hebrew alphabet. By Richard Michelson Michelson, best known for such witty collections of verse as Animals That Ought to Be, returns to the intergenerational themes of his Grandpa's Gamble for this nostalgic volume, handsomely illustrated by Waldman (The Golden City) in a sepia-toned palette recalling old family albums. Aaron, a baseball enthusiast who roots for the Brooklyn Dodgers, watches as his zayde (grandfather) moves in, bringing his library of Yiddish books ("Had Zayde really read them all? Each with its own ideas and mysteries. Each with its own secret world"). But Zayde declines to teach Aaron Yiddish: "[In America] Jews should speak English just like everyone else." Not until after Aaron has graduated from high school does he realize the importance of learning about Zayde's Yiddish heritage. In the end, Aaron teaches his own son Yiddish. Michelson sprinkles the text with Yiddish and the publisher has bound the book "back to front," like a Yiddish book. The story possesses both power and pathos, and its message, that Yiddish is an endangered language, is urgent. The afterword, which will hold readers' attention as well, describes Aaron's real-life counterpart, founder of the National Yiddish Book Center. Michelson's delivery, from its grown-up protagonist to its exhortation to learn a language not readily available to most children, may make the book best suited to sharing with a grandparent or parent.